Browse: Home /	Food, Water / Delicious, Refreshing… NYC Water! 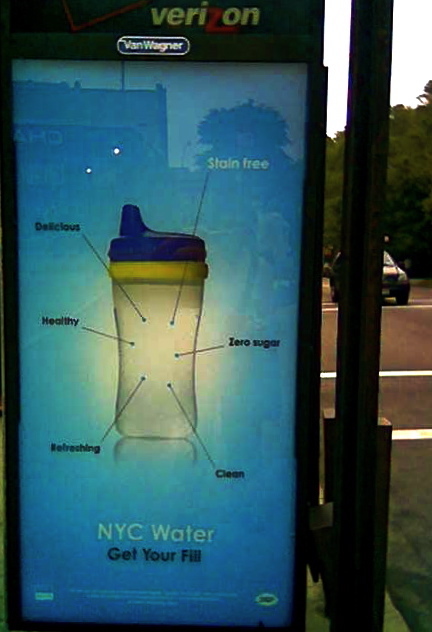 Last week’s post on the unsustainability of bottled water prompted a comment that someone should do PSAs promoting the quality of New York City tap water… and today I stumbled upon one! While advertising buffs might debate how “compelling” this campaign is, it will hopefully raise questions about the assumption that bottled water is automatically cleaner and healthier (it isn’t). Yes, it’s pretty exciting that the city launched this new tap water campaign last week. There are about 6 different ads and all except the one you showed have more of an alcohol related theme (“on the rocks”, “straight-up”, “with a twist”). I work with teenagers in trying to get them to drink less soda and more water. They think tap water is disgusting and dirty. It’ll take some time for them to come around to the idea that tap is no different from bottled…but I think we’ll get there. I saw this ad and it totally made me thirsty for tap water. Go city!